Home » Posts tagged "Sewing Operator skill summary"
Sewing operator recruitment is a tough job in the apparel industry. To recruit the best quality and efficient operator, sewing operators have to stitch one, two or three bundle garments with good seam quality by a certain time, recruiter checks his/ her production capacity and product quality and can be seen how many operations an operator can do, these few criteria set his grading. Then, Grade, wise operator salary is fixed by sewing operator recruiter, garments manufacturer have own operator grade wise salary standard. Here in this article, you will have details idea of Sewing Machine Operator Recruitment, Grading and Skill Matrix. Lots of factors have to consider when doing operator grading. First, we have to know what type of operation operator does, then the operator’s production efficiency and many others factor. 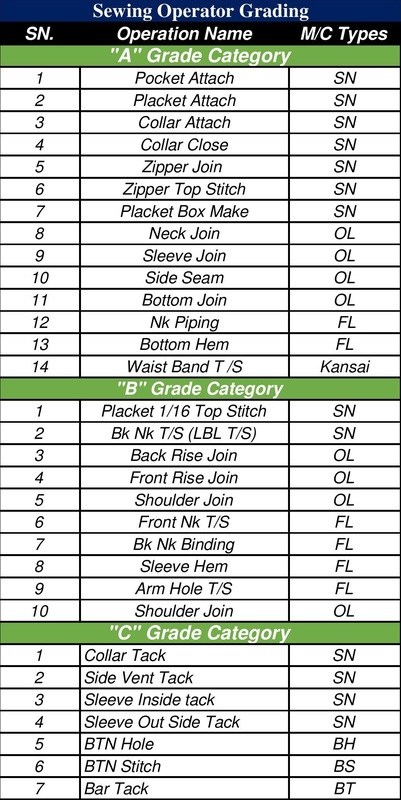 Here you can see below information on how to grade sewing operator. 1 to 10 Marks will be given for types in satisfaction level of production management. Sewing operator skill matrix or summary is a database of operator production capacity of different operation, number of machine and operation with the name he can operate, these process efficiency, salary, date of join. The database makes in Excel (spreadsheet), keeping by IE department in the apparel industry. This database help factory to migrate operator to another operation, to find out best sewing operator easily, to do operator grading easily.